State Park Motors knows how much people love their dogs. They like to take them on car rides. However, dogs shed a lot, and this can get pet hair everywhere. There are ways to get pet hair out of your car and minimize it in the future. One of the best ways to remove pet hair is to vacuum with a rubber attachment with bristles. These bristles will loosen the hair, and powerful suction can then pull the hair away. A sticky lint roller is another means by which you can get pet hair out of your vehicle. 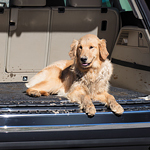 There are two good ways to keep pet hair out of your car. Before letting your pet in the car, brush your pet thoroughly. You should also place an old sheet or blanket over your car seats when the pet is in the car. This will catch the hair and keep it off the seats.